A fully automated algorithm allowed knot detection and positioning on computed tomography (CT) images of Douglas-fir logs. The detection of knot diameter and status could benefit from further improvements, i.e., testing other configurations and implementing texture measures. Manual measurement on CT images allows for tridimensional assessment and greater attainable sampling, while manual measurement on discs provides additional color and texture information. Computed tomography (CT) is a very successful tool to non-destructively acquire the internal knot structure of a log. To enable large-scale applications, an algorithm that automatically detects knots is required. The accuracy of such algorithms depends heavily on the species and image resolution. This study validates a knot detection algorithm (Johansson et al. in Comput Electron Agric 96:238–45, 2013) on fresh Douglas-fir (Pseudotsuga menziesii (Mirb.) Franco) logs. 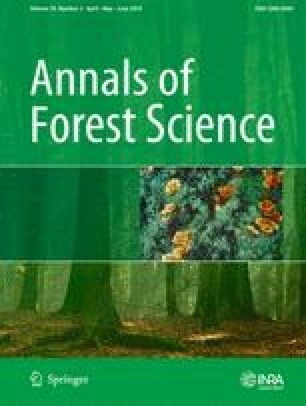 In this study, 282 knots were sampled from 15 logs, selected from six 78-year-old trees in southwest Germany. The validation of the algorithm’s knot detection was performed via comparison against two manual methods: on physical samples and on CT images. The saturated sapwood negatively influences the overall knot detection, which causes underestimation of knot diameter in this area or incomplete detection. The algorithm tended to overestimate knot diameter, longitudinal position, and knot length. The algorithm provides the knot position with satisfactory accuracy. Other settings on contrast and considered volume around a knot can be tested within the algorithm, as well as new development and implementation of texture measures in the image analysis to improve the accuracy results for Douglas-fir in future investigations. Bruna L. Longo collected data, tested and adjusted CT algorithm configurations, analyzed the data, and wrote the manuscript. Franka Brüchert designed the experiment, supervised the work, coordinated the research project, and revised the manuscript. Gero Becker supervised the work, coordinated the research project, and revised the manuscript. Udo H. Sauter supervised the work and revised the manuscript. The authors would like to thank Anne-Sophie Stelzer for many productive discussions and useful insights. Full PhD scholarship granted to Bruna Laís Longo within the CAPES/CNPq/DAAD framework, under the partnership agreement between the Brazilian Ministry of Education (represented by CAPES and CNPq agencies) and the German Academic Exchange Service (DAAD).